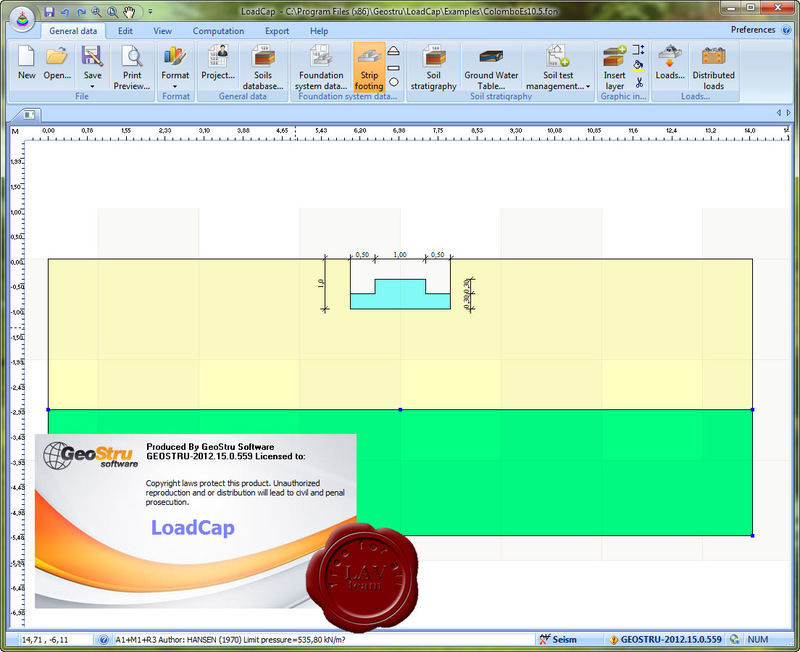 LoadCap id design for the computation of limit load in loose soils or rock, according Terzaghi, Meyerhof, Hansen, Vesic, Brinch-Hansen, Richards etc. Al, the computation of bearing capacity factors (according to the instructions for the geotechnical design in seismic areas - Italian Association of Geotechnical Engineering). Settlements: Elastic (Timoshenko and Goodier), Oedometric, Schmertmann, Burland & Burbidge, liquefaction usig the method of Seed and Idris (1971). The settlements can be calculated at any point either inside or outside the foundation. Limit load in seismic conditions: SHIKHIEV & JAKOVLEV, RICHARDS, NTC 2008 Circolare applicativa. Diagrams: Limit load as a function of the foundation base, of the depth of the bearing surface, of the acting loads. Unlimited number of layers. Display of pressure bulbs and failure wedges. Supported computation standards: Eurocode 7/8, British Codes BS8004, Norme tecniche costruzioni (NTC 2008), NTC - Circolare 2 Febbraio 2009, n. 617, C.S.L.LPP. Dynamic Probing.This software performs Dynamic Penetrometry, that is the reading, recording, interpretation, storage and the management of any type of penetrometer including new or custom equipment and of in borehole SPT readings. 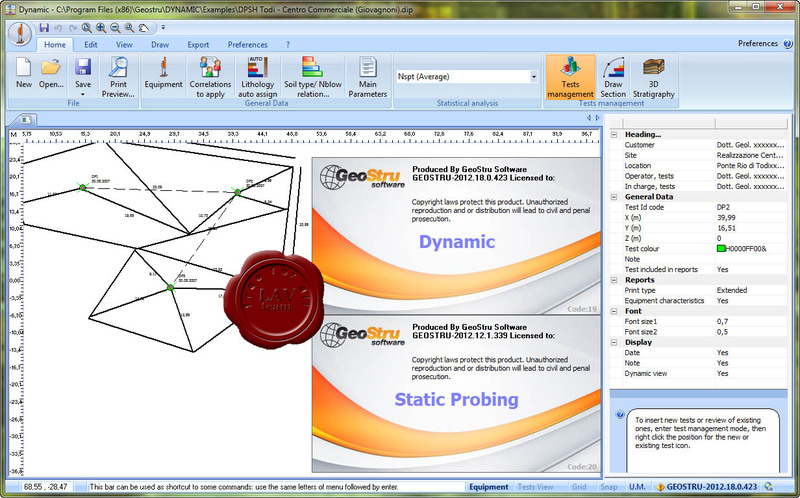 Dynamic Probing provides functions for the archiving of readings by site and for automatic calculation of the real energy transmitted, including correction for warp and the correlation coefficient with SPT (standard reference tests for geomechanic calculations and geotechnic correlations). Processing of data is instantaneous, deriving the values of Ndp&Rd and immediately generating a graphic display. In addition, the software proposes discrete layer boundaries and enables bitmaps or colors to be assigned for lithologic coding. In geotechnic calculation for coherent and incoherent terrains, several correlations are available for diverse lithologic types, which provide a more precise ‘geotechnic calibration’ for the specific trials zone. Static Probing. This program processes and archives penetrometric equipment readings for static penetrometers such as CPT (Cone penetration test), CPTE (Cone penetration test electric) and CPTU (Cone penetration test Piezocone). Step intervals - even centimetric- are user selected. The most authoritative lithographic and stratigraphic interpretation methods are used, both the more traditional (Begemann e Schmertmann) and the more recent (Robertson, Douglas-Olsen, Koester etc.) with standard or "normalized" values for qc & fs. Stratigraphic interpretation may be performed either automatically or at user selection based on site experience. Electronic data gathering unit outputs can be input directly to the program. The program provides the facility to calculate directly bearing capacity parameters for surface or deep foundations.